XpertMartTM includes the full compliment of Point-of-Sale reports you need to reconcile all of the transactions of the day and track flows of money and merchandise. 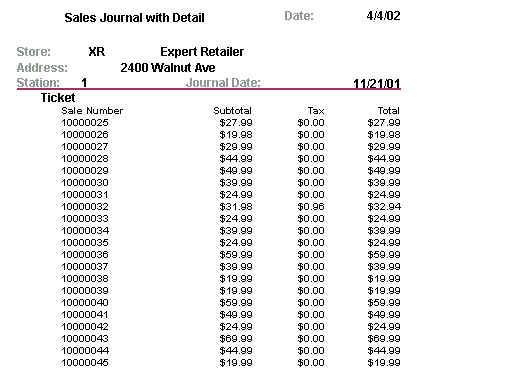 Below is an example of the Sales Journal which shows all of the invoices of the day with subtotals, tax and totals. There are variants of this report that show the detail behind every invoice. 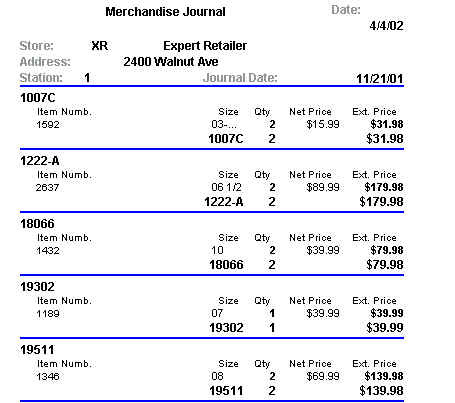 The Merchandise Journal shown below shows all items sold during the day grouped by style. 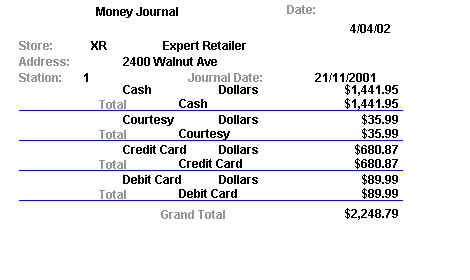 The Money Journal shows the total amount received in a day and breaks it down by payment type, including, for example, cash, check, credit card and so on. For each payment type (definible by the user at the Main), there is a corresponding report that shows subtotals for that type, for example, by each kind of credit card as seen below. There are companion reports that detail every invoice that was paid for using each kind of credit card, as well as the items which were purchased. In all there are over 30 Point-of-Sale reports in the system.